Can you imagine how Einstein would have an affect on selling or buying original art online? Scrolling through Instagram or Facebook have you ever stopped on a picture of a dog or cat that reminds you of a pet you have, or had in the past? 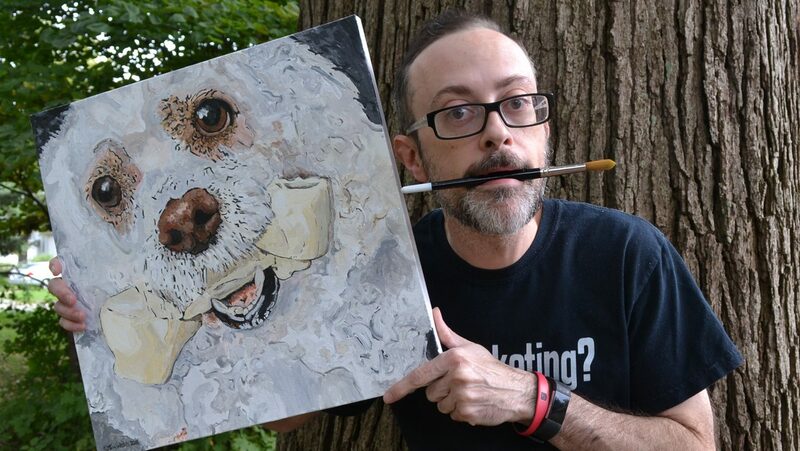 As a portrait artist I commonly paint pets for clients. Scrolling on Instagram one day I just stopped and Einstein popped right out at me. No, not the famous German scientist, Einstein the Labrador retriever. He was so adorable I just had to do a painting of him. The dog belongs to my Internet friend Rob Bell, of Rob Bell Web Design in Wakefield England! He didn’t ask me paint his dog, I just did because I liked his picture. At the very least the painting I was about to create could serve as an example on my web site right? Thinking it would be a good idea to learn more about Einstein (Rob’s awesome Labrador retriever), I asked him via Facebook if he could tell me a little more about himself and his dog. Rob told me that Einstein has dual personalities. (Many labs do) He loves to be lazy and take naps at home but out in the world he’s a “massive giddy kipper” to quote Rob. According to the urban dictionary it just means “overly excited” which definitely describes the labs I’ve known over the years. Here’s Einstein the Lovable Labrador from Jolly old England. The image size is 14×16 inches and it’s painted in watercolor on paper. After posting several pictures of the painting in progress on Instagram and Facebook Rob decided to show all his Facebook friends the picture of the painting I’d started. Just then it dawned on me that this might be an interesting way to find new clients. So that’s connection of how Einstein had an affect on selling and buying original art online. (It just wasn’t the Einstein you may have been thinking of). As of yet I haven’t asked Rob if he wants to buy the painting of Einstein but I have decided to post it up for sale as a print on Fine Art America. You can find it by visiting the link. I’ll of course give Rob the first chance at buying the original.